I’m a person with lots of UFOs. They don’t bother me, I’m old enough to know that one day I will finish them. Or, if they’re coming out as I planned, I frog them (no problem with that either). I like to start new projects, I work on them for a while, and then I start a new one. It’s my way of working. So here are two projects from my UFO bin: a sweater that is completed except for the finishing bath, and a gang of small balls of singles yarn that will one day become a sock yarn. The sweater: I made it from left over yarns. I have a lot of left over yarns! All except the red yarn are commercial yarns. And this is after. 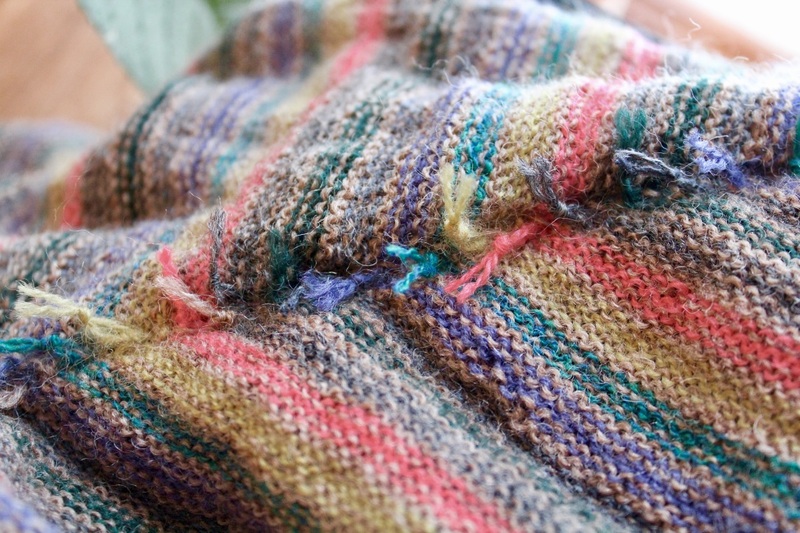 I make one knot while knitting, and the second afterwards to secure the slippery fibers. Small balls of different fine fibers spun on different tools. Some of them have been waiting for a couple of years, some I’m still spinning. 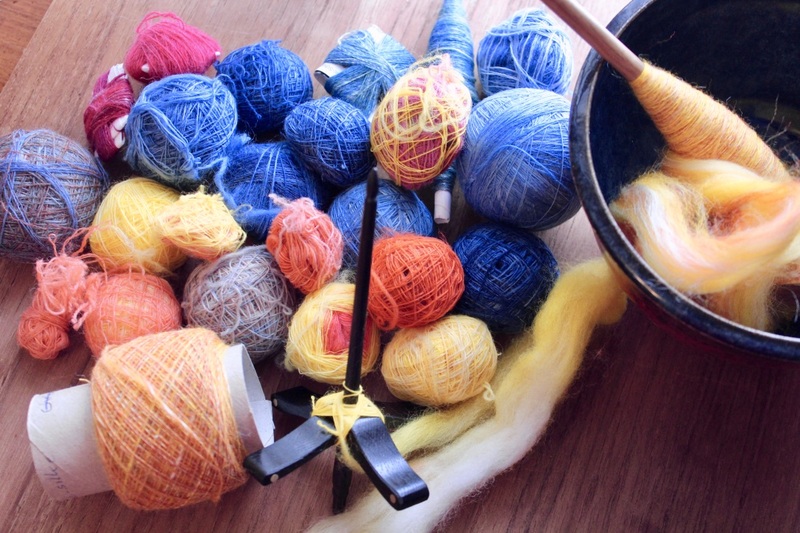 When I’ve finished spinning = when I think I have enough yarn for a 4-ply, I ply. These are my default singles of mainly merino and silk. I could make a cabled yarn, but as I’ve used so many different tools, I’m not 100% sure the twist is consistent through all yarns. A cable seems a bit hazardous, so: a plain 4-ply it’ll be. I just have to finish the yellow tops, then I’ll ply. I promise to show the sweater and the yarn as soon as they’re finished!